Love this pub! A new Manager couple took over early this year and seem to have whipped this pub into shape. New kitchen towards the back of the restaurant area looks really smart and the menu is really good too. Still pub classics but some nice variations on British food. 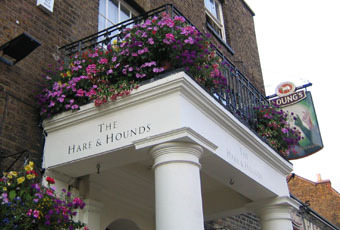 Staff are friendly and polite, garden is beautifully kept and a great selection on Ales on the pumps. If you haven't visited for a while, I'd recommend giving it a go as it really has changed for the better. I'll defiantly visit more regularly. Horrific evening. Subjected to an extraordinarily intimidating outburst from the manager which was both mortifyingly humiliating and deeply unfair. Still reeling with shock and very upset. Such a shame. Booked this pub for a family Sunday lunch as it looked child friendly and had a large beer garden. The day we went was windy and overcast so the beer garden was empty. The food was good, although having to pay 50p extra for peas with a £5 children's sausage and chips meal seemed a little mean. Sadly the family friendliness extended more to the dogs that were allowed in the restaurant and beer garden and allowed to urinate where they pleased. Children however, didn't seem to go down as well as our canine friends with the 'manager' and we were made to feel extremely unwelcome. The Hare and Hounds needs to embrace the fact that marketing itself as 'child friendly' means more than just offering a cursory kids menu. There are plenty of other really child friendly pubs in the area that we'll be going to in future. This is the least child friendly pub ever, it seriously needs to appreciate its audience, this is sheen after all! The bar staff are friendly and almost seem apologetic of the managers and rightly so! The male and female manager here seem to totally hate children, which makes a pub in sheen with an enormous garden seem an extraordinary choice for them. Every evening the woman can be seen standing scowling on the fringes of their gorgeous garden, checking again and again with her staff that they have informed all tables of the chuck out time for kids! As you enter the garden you are welcomed with warnings that parents and their children will be asked to leave if they make too much noise (which is a considerate given rather than something you need large bespoke signs printed to dictate!) the pub itself has all the makings for a great place and in a massively family centred area it could be so lovely, the plough up the road has far less outside space but they are so great about kids, its definitely the nicer family environment and the food is way better. I have given this pub 5 out of 10 and those 5 are for the venue itself and the live musicians on Sundays, a real shame as with more welcoming managers it could easily be a 10.